On the last Saturday of March 1893, the committee of Inverness Mechanics Cricket Club invited representatives of other cricket clubs in the area to a meeting at which the possibility of forming a cricket association would he discussed. Some of those present were of the opinion that playing cricket for any trophy was undignified. "Cricket should he played for itself and not for baubles" declared one representative. The majority, however, were in favour of forming a cricket association and determined that the North of Scotland Cricket League should be immediately instituted. A constitution was drawn up in April and teams were asked for a joining fee of one pound and thereafter ten shillings per annum. That summer nine teams competed for a cup competition played on a knock-out basis. They were: Cameron Highlanders, Dingwall, Elgin, Forres St. Lawrence, Inverness College, Inverness Mechanics, Northern Counties, Nairn County and St. Duthus (Tain). Of these clubs, only Elgin and Forres St. lawrence have been members of the association continuously since its inception. That the North of Scotland Cricket Association was formed at this time was due in no small measure to the enthusiasm of Mr. J. Chrystal Smith, a Perthshire man who had come north to teach in Inverness. There was great excitement in Inverness on the 2nd of September 1893 when the first cup final took place in the Northern Meeting Park between Northern Counties and Elgin. The result was an easy win for Northern Counties who scored 201 for 6, Elgin being all out for 76. Counties' big total was due to their opening batsman, W. M. Gossip, who scored 101 not out. (He was dropped when he had scored only two runs). The Association's first representative match took place in Inverness in 1894 when a Northern XVIII played Hall's North of England Xl. This was a two day match. Hall's scored 150 and 133 while the home side scored 77 and 121. The knock-out cup format was dropped in 1896 when a proper league competition was introduced. 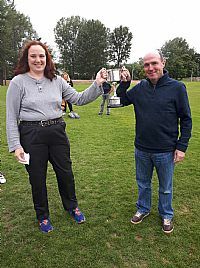 Four years later, at the end of the season, the Association's first representative match against the Aberdeenshire Cricket Association took place. Batting first, the North scored 98 runs and in reply Aberdeenshire was all out for 39. The Elgin Courant reported: " Bring down the curtains. Exit ye thoughts of the willow! The season that has just concluded has been crowned by magnificent success." In 1902, an annual match was introduced between teams representing the East and West of the region. This first match ended in a draw, the West being unable to capture the East's tenth wicket. Playing for the East was the Rev. G. S. Peebles of Forres St. Lawrence whose young son Ian was already a keen cricketer. Later he would play for Middlesex and England and was frequently referred to as the best bowler in England. In thirteen tests he took 45 wickets. For thirty-six years, William Smith was secretary of the Association and he was indefatigable in his efforts to arrange the most attractive fixtures for the Association's representative side. In 1911 he managed to persuade an All Indian Xl to come north. The Indian side scored the highest total ever seen in the North of Scotland - 401 for 4. It is said that the North fielders were exhausted climbing walls and fences while retrieving the ball! The home team scored 158 and 104. Then in 1914, the Imperial Australian XI played the Association and in the 1920s Leicestershire, Lancashire and Kent County agreed to come north thanks to the persuasive powers of Mr. Smith. In 1926 "he was instrumental in securing the visit of the redoubtable colonials" (the Australians). This Australian Xl played at Forres to mark the opening of Forres's new park which had been gifted by Sir Alexander Grant. The visitors scored 385 in reply to the North's 96. Mr. Smith retired in 1934 and to crown his achievements in bringing the finest teams to the North, the Australian test team came that year to play at Forres. A two innings match on Friday 12th September resulted in an innings defeat for the North Xl. Nevertheless, the home team managed to dismiss the Australians for 166, Ian Peebles taking 5 for 84. On Saturday. in reply to the North's total of 103 all out, the Australians were 137 all out, Braid of Northern Counties and Kemp of Forres each taking 4 wickets. Donald Bradman scored 7 on Friday (c. Richardson of Huntly b. Kemp of Forres) and 2 on Saturday (b. Braid of Northern Counties). As time passed, other clubs joined the Association. Some were members for only a short time. These include Auldearn, Elgin St. Andrews, Ladysbridge Hospital and Railway Clerks and many military sides (K.O.S.B., 93rd Highlanders, Seaforths, H.L.I., Black Watch, Cameron Highlanders, RNAS Evanton, RNAS Milltown, RAF Dalcross etc.) Representing the forces at the present time are RAF Kinloss (joining in 1949 as RNAS Kinloss) and RAF Lossiemouth (joining in 1949). At the present time, the Senior League comprises the four founder members (Northern Counties, Nairn County, Forres St. Lawrence and Elgin), the two RAF sides and Buckie C.C. who joined the Association in 1927, Huntly (in 1933), Ross County (in 1948), Keith (in 1950), Highland (in 1957) and Fochabers (in 1958) also members of the association are Fort William, Caithness and Poolewe. In addition to the Senior League championship, teams have competed since 1933 for the Senior Knock-out cup. A recent innovation is a 20-20 competition. In 2006, for the first time, the Association entered a team in one of the national competitions, namely the Scottish Cricket Union Cup. A Reserve league was introduced in 1930 and a Reserve K.O. Cup in 1950. There is also a vibrant junior cricket programme with a full programme of competitions and coaching.